UPDATE: I am proud to announce that my debut novel, Soundtrack to the End of the World, is officially available! No, not THAT Labyrinth! I mean, sure, great movie and all that. It’s just not what I’m referring to. You understand, don’t you, Bowie? No need to get sassy. You’re just going to have to take a back seat this time. Don’t give me that look. The old “Pomeranian eyes” may work with the ladies, but I know better. Skedaddle, Bowie. Git! No, no. It’s too late for gifts, no matter how much I like shiny balls. That is NOT what I meant by shiny balls. Put that thing away and let me get on with my post. Freakin’ David Bowie. Some of you (like one or two) may have noticed I’ve been gone for the bulk of November. I haven’t been purposefully neglecting my blog. Oh, far from it. The truth of the matter is I’ve been lost in a labyrinth. It’s a dark place, and I’m afraid I’m hopelessly lost. In fact, it wasn’t until yesterday that I had a breakthrough, thanks to the amazing Cate Gardner. You see, she sent a little twitter message. When my phone buzzed in my pocket, I screamed like a little girl. Now, I’m no dope. I checked for cell service a long time ago. 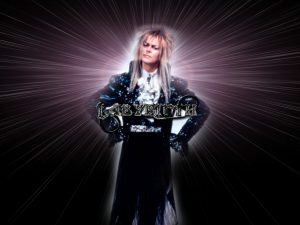 Little did I know, however, there is a faint wifi signal here in the labyrinth (hence my finally being able to update the blog), and Cate’s message alerted me to this! Better still, I’ve found that I can use the wifi signal as something of a compass, going in the direction of increasing signal strength. It’s only a matter of time now. Within the next two months, I will release my first ebook short story collection, Welcome to Moon Hill. It will contain over a dozen never before seen stories and one or two reprints of favorites. Be cautious if you do decide to accompany me to Moon Hill, because like entering the labyrinth, you may never leave.